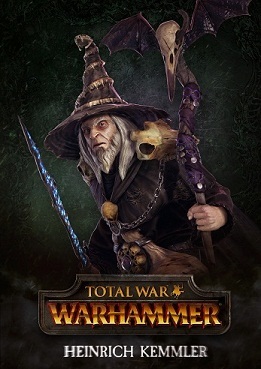 In Total War Warhmmer, the death lurks everywhere. Manfred von Carstein was not dead. He rose again and seeks to destroy the people. Those who oppose will be destroyed and those who whish to follow him could join his undead army. Emperor Karl Franz stands in his way and therefore he must be destroyed. On the contrary, the Vampire Counts have a high number of spells and battle magic over dwarfs. Your heroes and commanders can summon units or resurrect fallen enemies, so that they join you. Their magic weakens enemies and strengthens their own ranks. In addition, the Vampire Counts have very fast and fearsome flying units, which erode the leadership of your opponents. Vampire Counts spread fear in their close enemies while the enemies in distance are relatively safe because the Vampire Counts have no individual missile unit. So if you wanted to tackle the distance opponents, then you should choose a different faction. - Carstein has spells like teaching the Vampire and Lore of Death. - Kemmler is a pure magician. - He is the master of the teachings of the Vampire. - His magic act as buffs, spells and curses basement. The army Vampire Counts is numerous and exclusively focused on the melee. They don’t have floor units, but very cruel like units that slide over the enemy lines to selectively destroy artillery or first terrorize the weak. The size of the air units makes them hazardous, the giants of the Greenskins. - Varghulf: Fast monsters with strong regeneration. - Hexwraiths: A cavalry of disembodied undead. They take less damage from non-magical weapons and can be placed on the battlefield alongside the enemy placements. Since the Vampire Counts lack of long range, you should try to compensate for this. But don’t worry, these undead are quite able to overcome this. - Use magic! The Vampire Counts have many useful spells and can do ranged damage. - Best flight units in the game. With them you can, for example, opposing ranged artillery attack. - Use your zombies as Meat shield. You can slow down and deal, that your higher priced, more powerful units can be used tactically. - Therefore, you should always combine expensive and cheap units in your army. - The cavalry is very expensive, buy it if you have a lot of money, otherwise it's not worth it. - Spear infantry is required! The Vampire Counts are vulnerable to monsters, which is why you have to lock it with spears. - Two units Crypt Ghouls. - Approximately three units zombies. - Use ghosts, they are equip with estoc and take even little damage. - Cavalry: If you have enough gold, then take Black Knight, if you don’t have, then buy Dire Wolves. If you play with the Vampire Lord, you should avoid your commander’s death. If this happens, then your leadership is reduced considerably and starts the units to fall apart. In addition, you should beware of Knights of the Grail. These are tremendously effective against your ghost and Hexwraiths. - As commander of the Vampire Counts can resurrect their dead, so they join your ranks. This is done directly and you don’t have to wait for any round. It can be raised but only standard units. - You have access to many spells by your heroes and commanders. So you can regenerate units, weakening enemies or crush. - If Vampire Counts terrain is corrupted. Your armies can march across this. If the terrain is not corrupted, so your troops suffer bear damage. Vampire Counts are a good fraction for those who prefer magic, and they also spread fear among the opponents.